If you have a silly ironic sense of humor then you will like this book. 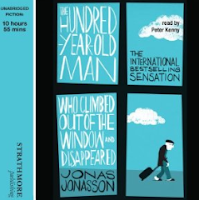 It is about a witty old man called Allen who climes out of his nursing home window on his 100 year old birthday. Allen has Asperger’s. He is literal and highly intelligent. He also likes a good glass of vodka. Allen gets caught up with an unlikely set of friends along the way and ends up on the run from the police. For me I thought the book started strong and I couldn’t put it down, I struggled with the story when it jumped back to Allen’s past. At first I preferred the present day story but I stayed with it and I’m glad I did. By the end of the book it felt as if I was enjoying two funny stories that all tided together nicely at the end. Without giving away any spoilers, I really was not sure how the book was going to end or how they could get out of the mess they had all created, or even if they could. I liked the ending. It was a very funny ending, that’s all I’m saying. Narrated By Peter Kenny who I thought was fabulous to listen to. His narration was clear and consistent and his voices where also consistent.